Students & parent are now able to submit signed tax returns and statements of non-filing; this information does not need to be obtained directly from the IRS. Please contact our office at 518.743.2223 or finaidoffice@sunyacc.edu with questions. The cost of college can be a major expense, but Financial Aid makes earning a degree accessible to everyone. Financial Aid helps students and their families pay for college expenses, including tuition and fees, room and board, books and supplies and transportation. Types of financial aid include grants, scholarships, work-study and loans. Most full-time college students receive some form of Financial Aid. 1. Create an FSA ID by clicking HERE. An FSA ID ― your username and password ―replaced the Federal Student Aid PIN and is now used as your electronic signature for all of your federal aid documents. You will need an FSA ID to electronically sign and submit your FAFSA, and to make any needed corrections later. If you are a dependent student, your parent will need his or her own FSA ID, too. This FSA ID is also used to process your federal subsidized and unsubsidized loans. Your parent will need their FSA ID if they intend to borrow a PLUS loan. 2. Complete your FAFSA with school code 002860. Meet with Financial Aid staff every Tuesday from 1 to 4 p.m. at our Wilton Center. All Financial Aid forms are available in PDF format. Download them HERE. Hard copies are also available from the Financial Aid Office in Warren Hall. You may also contact us at 518.743.2223 or finaidoffice@sunyacc.edu to request a copy be mailed to you. You must complete the Free Application for Federal Student Aid (FAFSA) to be considered for financial aid from the federal government and SUNY Adirondack. Completing the FAFSA will qualify you for grants, scholarships, work-study and loans. All applications must be completed correctly and in a timely manner. The FAFSA can take up to 4 weeks with a printed signature page and 3 to 5 business days if a student and parent sign using a federal PIN number. The SUNY Adirondack Financial Aid office uses the FAFSA results to determine eligibility for various financial aid programs and prepares a financial aid award letter that offers an award or combination of awards to the student. The total amount of financial aid that a student receives is referred to as a Financial Aid Packet. U.S. citizenship or eligible non-citizens. (Foreign students may apply only for SUNY Adirondack scholarships). Matriculation in a degree or certification program. Enrolled in at least 6 semester credits. (Note: Only federal Pell grants are available to less-than-half-time students). Can’t be in default of any federal student loan nor owe a refund on a federal grant. When do I need to apply for Financial Aid? The first day you can submit the national FAFSA form is Oct. 1 of the year before you plan to go to college. Plan to file the FAFSA as soon as possible because Financial Aid dollars are limited and, in many cases, are awarded on a first-come, first-served basis. In order to have Financial Aid in place before the bill due date, SUNY Adirondack students should file by June 1 for fall semester and December 1 for spring semester. Be sure to read all materials thoroughly and respond to all requests for additional information. If you have any questions, reach out to the SUNY Adirondack Financial Aid Office. SUNY Application for Admissions: Only matriculated students qualify for Financial Aid. Matriculated means that you have applied for Admissions to SUNY Adirondack, been accepted and are enrolled in classes required for a SUNY Adirondack degree or certificate program. (To apply to Admissions, click HERE). Free Application for Federal Student Aid (FAFSA): To receive federal grants, loans or work-study opportunities, you must complete the FAFSA annually. New York state also requires completion of a valid FAFSA prior to a student’s application for state grants and scholarships. Express TAP Application: The ETA is used to determine eligibility for the Tuition Assistance Program (TAP). TAP is limited to full-time (12 or more credits required for a SUNY Adirondack degree or certificate program) students, however, part-time students registered with the College’s Accessibility Services Office are encouraged to inquire about their individual eligibility under ADA guidelines. Once I’ve received Financial Aid, what do I need to do to maintain it? The U.S. Department of Education and New York state award financial aid to assist students and families in meeting the cost of a college education. Students, however, must meet certain expectations, called Satisfactory Academic Progress, to receive those awards. Federal regulations require all schools to review Financial Aid applicants at least once during an aid year prior to the award and payment of federal funds (grants, loans and work-study). Students must maintain a minimum cumulative grade point average, factoring in the number of credit hours attempted. New York state aid, including grants and scholarships, requires students to meet established criteria for academic progress and pursuit of program. If you do not meet the minimum requirements, you will be ineligible to receive a state award. Federal regulations require all schools to establish Satisfactory Academic Progress (SAP) standards and review financial aid applicants at least once during an aid year prior to the award and payment of federal funds (grants, loans and work-study). Based on the number of credit hours attempted, there is an expectation with respect to minimum cumulative grade point average (CGPA) and credits earned (passed). This chart represents the current SAP requirements at SUNY Adirondack. LETTER FROM THE FINANCIAL AID OFFICE, AND MAINTAIN ELIGIBILITY FOR THE UPCOMING SEMESTER. 1 Students may appeal if one or more conditions are not being met. Please see below for detailed information. NOTE: FRESH START RULES DO NOT APPLY; WE MUST TAKE YOUR ORIGINAL ACADEMIC RECORD INTO CONSIDERATION. A student who receives a loss of eligibility notice from the SUNY Adirondack Financial Aid Office may appeal to possibly regain eligibility for aid. The appeal must be in writing and received by November 20th of the fall term, April 20th of the spring term. Your letter should fully explain why you did not succeed and what you will change to improve your academic performance going forward. You may be asked to document your circumstances. Per regulation, we are required to use the chart put forth by the Higher Education Services Corporation (HESC) to determine eligibility for NYS awards. Special Note: A student will be allowed to change majors no more than four times while in attendance at SUNY Adirondack. If a student changes majors more than four times he/she will be considered ineligible for federal aid, however, he/she has an option to submit a federal appeal and explain the circumstances that resulted in numerous major changes. A student may appeal the loss of state aid eligibility if the required New York State progress or pursuit standards are not met.​ Per regulation, we are required to use the chart put forth by Higher Education Services Corporation (HESC) to determine eligibility for NYS awards. *Your transcript will be needed to complete the application, which can be done at https://www.hesc.ny.gov/pay-for-college/financial-aid/types-of-financial-aid/nys-grants-scholarships-awards/new-york-state-part-time-scholarship-pts-award-program.html. A recipient of a PTS Award will receive an award that covers the cost of six credit hours or $1,500 per term, whichever is less, at a SUNY or CUNY community college. An award recipient is entitled to award payments for not more than four consecutive academic semesters. For more information on SUNY Adirondack scholarships, click HERE. To learn how to apply for Work Study, click HERE. Both the parent and student must not be in default on any federal education loans or owe an overpayment on a federal education grant. Both the parent and student must be U.S. citizens or eligible non-citizens. How many years does the student have to repay the loan? Are students required to pay interest while enrolled in school? Are there different repayment plans (i.e. based on income)? What are the criteria for deferring payments? If variable, what is the maximum percentage? Does the lender offer a principal or interest rate reduction if specific criteria are met? Does the lender offer interest rate reductions if an automatic payment from a checking or saving account is established? Does the lender release the co-signer once the borrower has made a number of on-time consecutive payments? SUNY Adirondack does not recommend or endorse any specific lender. Students and families have the right and ability to select the private education loan lender of their choice. Please note that some lenders may not work with community college students. The borrower chooses the lender and submits the application through that lender. The lender will communicate to SUNY Adirondack and we will notify the lender of the amount you are eligible to borrow and update your award package. We also suggest checking with local businesses and organizations for opportunities that may be available. How Much Will I Have to Pay for School? To determine how much aid a student you are eligible to receive, the Financial Aid Office factors in costs such as tuition, fees, room and board (includes on campus or off-campus living with parents or family), transportation, books and supplies and personal expenses. Students are awarded aid — scholarships, grants and loans — to assist in covering these charges. A student’s aid cannot exceed the student’s cost of attendance. Each year, colleges list a projected price to attend school, often called the “Published Price.” Most students, however, pay a smaller amount, referred to as “Net Price.” Net Price is determined by taking the Published Price and subtracting any gift aid, which includes grants and scholarships. The net price is different for every student. To determine your Net Price at SUNY Adirondack, use our Net Price calculator. While the Net Price Calculator is a valuable tool, families should realize that these are estimated values only and students will receive their individual awards from the SUNY Adirondack Financial Aid Office. A student’s out-of-pocket expenses may be less than estimated from the Net Price Calculator. Students can find answers to many Financial Aid questions through Self Service Banner. Login on a regular basis to keep track of your Financial Aid status. Check the “Award” section to review your aid eligibility, accept offered awards and confirm that your TAP (Tuition Assistance Program) application has been processed by New York State. The “Requirement Tracking” tab can answer questions about the status of your FAFSA record or any outstanding requirements, including verification materials, copy of DD-214 or Social Security card) needed prior to the review of your application. The “Financial Aid History” section will show aid received since 2007 and beyond, including your past and current loan history. See how your aid is applied to your semester tuition and fee charges in the “Student Accounts” section of Banner on the “Account Detail by Term” screen. For detailed instructions on how to use Self Service Banner, click HERE. SUNY Smart Track is a financial literacy service that can help any SUNY student make informed financial decisions before, during and after college. SUNY Smart Track can help you every step of the way, from the time you apply to college to after graduation. The online learning environment empowers students for a lifetime of financial success with interactive services, tools and resources on smart money management skills. Approximately 98% of financial aid applications are processed online. Here are some federal and state websites you can use to apply for financial aid. FAFSA on the Web: Fill out and submit the Free Application for Federal Student Aid (FAFSA) for the appropriate aid year or make corrections (add a school, update income figures). FSA ID: Short for the Federal Student Aid ID, this is used to electronically sign FAFSA, make corrections to submitted FAFSA, sign an MPN (Master Promissory Note) and check FAFSA status and aid history. TAP on the Web: Complete the Express TAP Application (ETA) online (grant program for NYS residents only). Higher Education Services Corporation (HESC): View your TAP status; change TAP college code or home address; request a duplicate Express TAP Application (ETA). US Department of Education Federal Student Aid: Portal to find general information on federal student aid. Completing the FAFSA: Offers general information, overview of application process and detailed help with application questions. Manage Your Direct Loans: One-stop location for students to complete a Master Promissory Note (MPN), view their loan history and plan for future repayment or for parents to apply for a PLUS loan. Loan Entrance Interview: Students can complete entrance counseling (required for new, first-time borrowers, recommended for all borrowers). National Student Loan Data System: View federal loans and/or grant amounts, complete exit counseling (graduates/transfers/withdrawals), outstanding balances, loan statuses, disbursements and history through the National Student Loan Data System. How will a withdrawal affect Financial Aid? Financial Aid recipients are encouraged to seek advice prior to withdrawing from a class. We will offer advice regarding the impact on the current semester and future aid eligibility at SUNY Adirondack. Ultimately, the decision is up to the student. Federal regulations require re-calculation of a student’s eligibility for federal grants (Pell, SEOG) and loans if the student withdraws prior to the 60% point of a semester. The Financial Aid office must determine how much federal aid has been earned based on the portion of the semester completed. A re-calculation could result in the need for a student to return funds to the federal government (including repayment of refunds) and/or a debt to the college. Each aid year, the U.S. Department of Education randomly selects students who file the FAFSA for review in a process called “verification.” The college is responsible to collect selected students financial documents and verify that the information on the FAFSA is accurate and complete. When SUNY Adirondack is notified that a student has been selected for verification, we send a tracking letter formally requesting the documents and enclosing the verification worksheet. Students can find the documents needed to complete the process listed in the “Requirements” category in Self Service Banner. In most cases, the college simply needs to collect a tax transcript of the prior year’s federal tax returns (if the student and/or parent did not use the IRS Data Retrieval Tool within FAFSA) and a signed verification worksheet. A student must complete the verification process before the college can review his or her Financial Aid application and determine eligibility for aid. signing the verification sheet, with parent signature if applicable. promptly submitting requested documents — or resubmitting, if an item is returned to you for completion or signature. Bookstore advances allow eligible students to charge all or a portion of their cost for textbooks and related supplies at the College Bookstore. When using loan funds, students must NOT be eligible for Federal Pell and must submit an application to Student Accounts EACH SEMESTER. Those using federal grant money will automatically have it offered. If students using their federal grant money do not wish to participate, an opt-out form is available at the Financial Aid or Student Accounts Offices. Academic Year: The student's enrollment period for which financial assistance/aid is awarded. The federal definition of academic year is July 1 through June 30. The FAFSA must be completed each academic year for consideration for federal aid. ADA: The Americans with Disabilities Act specifies that the full time requirement for financial aid eligibility is eliminated. Students meeting the ADA guidelines may receive NYS financial aid even if they are not enrolled full time in 12 or more credits. APTS: Aid for Part Time Study is a limited NYS grant available to students attending college less than full time. This is a limited grant program, and is awarded on a first-come, first serve basis through the application process. Note that certain income-based criteria must be met to qualify. Award Letter: A list of all the financial aid awarded to a student by a school. Bookstore Advance: Funds are made available in the campus bookstore for students whose authorized aid exceeds tuition and fee charges and have a valid Certificate of Residency on file. This amount can be viewed on the Student Account section of your Self Service Banner account. Bursar: The college administrator who oversees billing and payment in the Student Accounts Office. Capitalization: The addition of unpaid interest to the principal balance of a loan. Census: Census is the process by which the College determines enrollment for the semester. The census is due after the 3rd full week of classes, at which time faculty verify attendance. This information is then evaluated to confirm financial aid eligibility. Changes to enrollment can result in changes to financial aid eligibility. 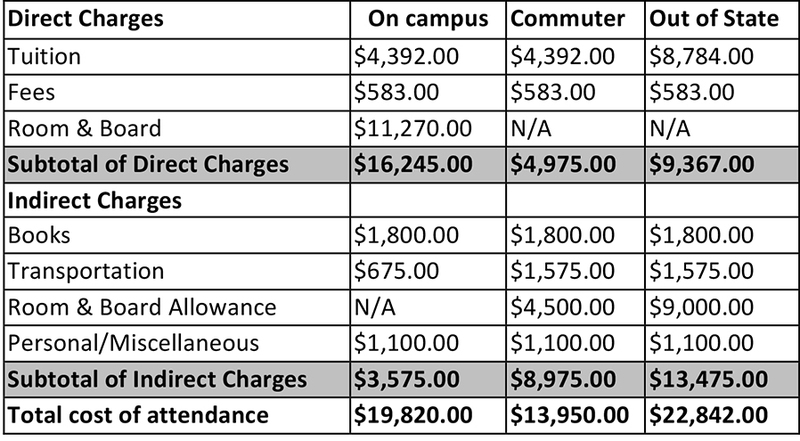 COA: The Cost Of Attendance is an estimate of both direct (billed) costs such as tuition and fees and indirect (unbilled) costs such as transportation and books for an enrollment period. Consolidation: The process of combining one or more loans into a single new loan. Credit Balance: The amount of aid remaining in a student's account after payment of all bill charges are covered. Deferment: A period of time set by your lender where student loan payments are postponed (i.e. if you are enrolled in school at least half time during the fall and spring semesters). Dependency Status: Determines who is required to provide information on the FAFSA, including income and signatures. A series of questions will assist students in determining whether they are considered dependent or independent for federal aid purposes. Direct Loans: Federal student loans, including Direct Subsidized Loans, Direct Unsubsidized Loans, Direct PLUS loans, and Direct Consolidation Loans. These are loans made directly with the U.S. Department of Education through the William D. Ford Federal Direct Loan Program. Disbursement: Payment of financial aid funds made to the school on behalf of the recipient. If disbursement results in a credit balance on your account you may be eligible for a refund. DRN: The Data Release Number is a unique 4-digit identifier found on the top right-hand corner of your SAR that allows you to release your FAFSA data to a school you have not yet listed on your FAFSA. EFC: The Expected Family Contribution, determined by your FAFSA, is an indicator of your family's financial strength and is used to calculate your federal student aid eligibility. Enrollment Status: The designation of a student as being enrolled Full Time (12 or more credits), Three Quarter Time (9-11 credits), Half Time (6-8 credits), or Less Than Half Time (fewer than 6 credits). ETA: Express TAP Application, completed at www.tapweb.org, is the New York State application for aid. FAFSA: Free Application for Federal Student Aid is the federal application for aid. Students may complete the FAFSA online at fafsa.ed.gov. FFEL: If you borrowed federal loans prior to July 1, 2010 you may have borrowed subsidized, unsubsidized, and/or PLUS loans processed by private lenders under the Federal Family Education Loan program. These loans were reinsured by the federal government as a result of the Health Care and Education Reconciliation Act of 2010. No new FFEL Program loans were made after July 1, 2010. Financial Need: COA minus EFC equals financial need. FSA ID: The FSA ID is a secure username and password that acts as your signature on federal student aid documents, including the FAFSA and your MPN (if you borrow federal loans). Grace Period: A period of time after a borrower graduates, leaves school, or drops below half-time (6 credits) where they are not required to may payments on their loan. Grant: Financial aid that does not need to be repaid. HESC: Higher Education Services Corporation is New York State's higher education student financial aid agency. HESC administers the TAP grant along with various state-issued scholarships. For more information, go to www.hesc.ny.gov. Interest: A loan expense charged for the use of borrowed money. Interest is paid by a borrower to a lender, and is calculated as a percentage of the unpaid principal on a loan. Interest Rate: The percentage at which interest is calculated on your loan(s). IRS DRT: The IRS Data Retrieval Tool on the FAFSA allows students and parents to import their income information to the FAFSA directly from the IRS. Legal Guardianship: A relationship created by a court order through which the court appoints an individual other than the student's parent to take care of the minor. LEU: The Lifetime Eligibility Used for the Pell grant in the form of a percentage. A student may receive no more than the equivalent of six full time years of grant funding at full time enrollment. This percentage is pro-rated if you attend less than full time. Matriculation: Indicates you have applied to and been accepted by SUNY Adirondack Admissions and are pursuing a degree or certificate program. Only matriculated students can receive federal and state financial aid. MPN: A Master Promissory Note is your agreement with the U.S. Department of Education to borrow a federal student loan and outlines your rights and responsibilities. Net Cost: Net cost is the difference between the COA and the financial aid package. NSLDS: National Student Loan Database that contains a student's information regarding Title IV financial aid. Students can login to review their aid history at nslds.ed.gov. Origination fee: An administrative fee assessed by the federal government and deducted from the amount borrowed, reducing the total funds made available to the student. Pell Grant: Federal grant awarded to students with an EFC less than $5,199 as determined by their FAFSA (prorated for three-quarter, half-time and less-than-half-time enrollment). The 2015-2016 Pell awards range between $581 and $5,765. PLUS Loan: A Parent Loan for Undergraduate Students is a federal loan product allowing parents to borrow up to cost of attendance less financial aid to help offset their child's education costs. This loan is credit based, and is not guaranteed. If a parent is denied a PLUS loan, contact the Financial Aid Office for information about other options available. Private Loan: Education loan programs established by private lenders to offset education costs not covered by the financial aid. Students may require a cosigner for eligibility as these loans are credit based. Required Course: A course that is required for your current SUNY Adirondack degree or certificate program. Only required coursework is eligible for financial aid. Classes that may be considered “not required” include classes taken after you have already met the requirement, multiple repeated coursework, or courses that are required for your transfer program. SAR: The Student Aid Report is a summary of the information that was submitted on your FAFSA. SAP: Students must meet Satisfactory Academic Progress as defined by the college to continue receiving federal aid. SSB: Self Service Banner, the student portal for information about your financial aid, student account, registration, etc. Subsidized: Federal student loans that do have the interest subsidized by the government while the student is enrolled at least half-time (6 credits). Eligibility for subsidized loans is based on demonstrated financial need. TAP Grant: Tuition Assistance Program (TAP) is a New York State grant for full-time NYS residents, and part-time residents under ADA guidelines, with a maximum award of 100% of tuition. Tax Return Transcript: An official IRS document that verifies the federal tax return data submitted. A copy of the 1040 form submitted is NOT considered a tax return transcript. Unsubsidized: Federal student loans that accrue interest while deferred. Students should always maximize any subsidized loans available before accepting unsubsidized loans. Verification: A random selection process that is required of roughly 30% of students nationwide by the Department of Education. This process requires financial aid administrators to verify certain information on the FAFSA before the student is eligible for federal financial aid. VSAC: Vermont Student Assistance Corp. is a public nonprofit agency created to help Vermonters who want to go to college or other training after high school. For more information, see www.vsac.org. Work Study: A federal or institutional grant that allows a student to have a part time job where they are paid bi-weekly while they are enrolled in school. While a work study grant will appear as part of the financial aid awards, it does not get credited to the student's bill. While the Net Price Calculator is a valuable tool, families should realize that these are estimated values only and students will receive their individual awards from the SUNY Adirondack Financial Aid Office. Please keep in mind that a student's out-of-pocket expenses may be less than estimated from NPC. Learn more about Exit Counseling by downloading this document. To complete, go to https://studentloans.gov. Can I receive financial aid for a repeated class? Both state and federal aid will pay for repeat of classes that are required towards your degree for which you did not receive credit (X, U, W, or F grades, or classes in which you did not attain the minimum grade required for your program of study). Federal aid can be used to repeat a previously passed class once to improve your GPA or transferability, however, NYS does not allow this. Can I receive financial aid if I attend school part time? You may be eligible for some financial aid. Factors for eligibility include meeting Satisfactory Academic Progress, the number of credits you enroll in, and whether or not your classes are required for your degree. For federal aid, student loans require enrollment in at least six credits/semester. Students can receive Pell for enrollment in a single class, depending on their EFC. For New York State aid, TAP requires full-time (12 credits) enrollment for students not registered under ADA guidelines. Students interested in being considered for NYS aid who are attending less than full time should contact the Financial Aid Office to find out more about Aid for Part-Time Study (APTS) criteria and application processing. Can I use financial aid for summer classes? Yes, financial aid is available for the summer. To request summer aid, you must submit a Summer Aid Application available each spring after registration begins. To be eligible, you must be enrolled in classes required for your degree. Note that there are caveats to summer aid that may impact future semester eligibility. The review for summer aid doesn’t take place until after spring grades are available, which is after the bill due date. We recommend that you make payment arrangements up front and then receive reimbursement after your aid is determined and disbursed to your account. Yes. Students are required to apply for financial aid every academic year. If you attended for one semester only, you are still required to complete one for each new academic year, which begins each fall. Has SUNY Adirondack received my FAFSA? You can review both received and outstanding document requirements in your Self-Service Banner account under the Requirement tab/link. If you do not see 'Student Aid Report' listed, then SUNY Adirondack has not yet received your FAFSA. Please note it can take 3-5 business days for processing after you submit your signed application. How can I appeal loss of financial aid eligibility? If you have received a Loss of Eligibility indicating loss of federal and/or state aid, you have the option to appeal this decision. Please submit a signed letter of explanation to the Financial Aid Office; your letter should fully explain why you did not succeed and what you will change to improve your academic performance going forward. You will be asked to document your circumstances. The appeal must be in writing and received within two weeks of receiving notice. Appeals submitted for evaluation to the Financial Aid Office are reviewed by an appeal committee. Students will be notified in writing via their wolfmail account of the decision. Per regulation, we are required to use the chart put forth by the Higher Education Services Corporation (HESC) to determine eligibility for NYS awards. The financial aid application process starts with the Free Application for Federal Student Aid (FAFSA), which allows the student to be considered for federal grants, loans and/or work-study opportunities. Students may apply online at www.FAFSA.ed.gov. Families that prefer the paper application can request one at (800) 4-FED-AID (800 433-3243). Students will also want to complete applications for state aid from the state they reside in to see if they may qualify for additional assistance in paying for school. How do I apply for New York State TAP? If you file the FAFSA online, then a link to the Express TAP Application (ETA) will display on the confirmation page. Follow this link to complete your TAP application. If you missed the link, you can apply directly with HESC at www.tapweb.org once your FAFSA has been processed. This link will take you directly to the start of the TAP application, where you will login and complete your application for the award year for which you are planning to attend. SUNY Adirondack has streamlined the scholarship award process. As such, there is no application process for awards. Every student who may be eligible is considered automatically for award. Student(s) best meeting criteria for each scholarship is selected. In some instances, further information may be required. If this is the case, then eligible students are notified that to be considered for the award they must submit an essay. How do I get my tax return transcript? If you are unable to use the IRS Data Retrieval Tool on the FAFSA and require a copy of your tax return transcript you can attain one directly from the IRS. Please see 2016-2017 IRS Tax Return Transcript Process* for more information. How do I review my financial aid in Self Service Banner (SSB)? Financial Aid information is available on Self Service Banner on the 'Award' tab. Here you can review your aid eligibility and accept offered awards. For more information regarding how to navigate this screen, including instructions on how to accept any pending awards, please see Banner Instructions*. I am having FAFSA processing issues. How do I contact the Federal Student Aid Information Center? Students requiring further assistance with NYS grants and scholarships can reach Higher Education Services Corp (HESC) at 888.697.4372 or toll free at 518.473.1574 between the hours of 8:00 am and 4:45 pm. I don't think I will qualify for aid. Should I apply anyway? Yes! Many families think they don’t qualify for aid, but many do. In addition, if you are interested in borrowing federal student loans, plan to participate in work study, or are the recipient of certain SUNY Adirondack scholarships you will be required to fill out a FAFSA in order to be eligible. I received a revised letter. What has changed? You can review your Self Service Banner account to see what changes have been made to your awards as outlined in the revised letter you received. Note that a reduction in aid may result in a balance due with the College. If I take a semester off do I have to start repaying my loans? The short answer: Not immediately. 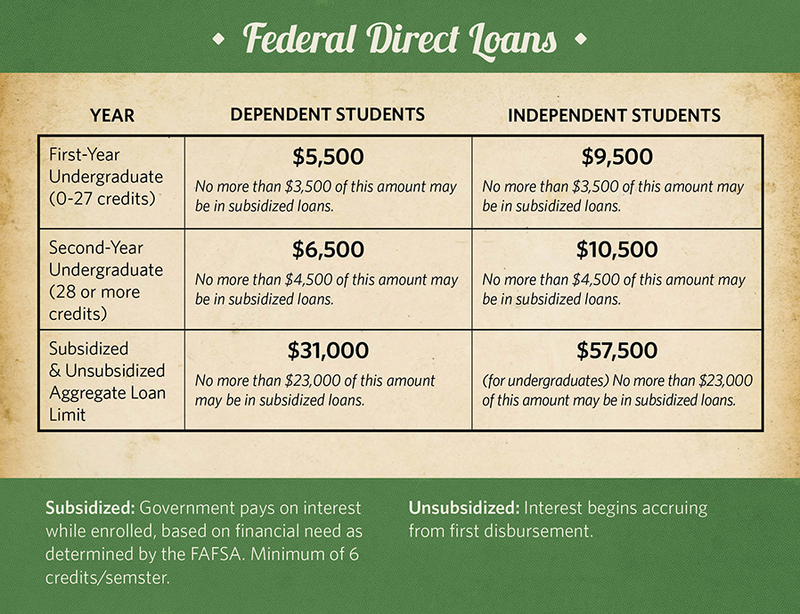 Federal subsidized and unsubsidized have a grace period of 6 months before the student must begin repaying the loan. If your parent borrowed PLUS loans, they may have the same criteria for repayment. When you take a leave of absence you will not have to repay your loan until the grace period is used up. However, if your exhaust your grace period while you are not enrolled you will have to start making payments on your loans. Also note that if you use up your entire grace period, then when you graduate you will have to begin repaying your loan immediately. My financial aid changed halfway through the semester? How can this happen? There are several reasons why this may occur. If you stopped attending one or more of your classes and your professor reported you abandoned the class, the financial aid office is obligated to recalculate your aid eligibility. This can also occur when a student changes their FAFSA or had a loan reported in default. My income is different this year. Am I eligible for more aid? The FAFSA takes many criteria into account, including household size and income, when estimating your EFC for federal aid eligibility. If you feel your FAFSA does not represent your household's current financial situation, you have the option to request a Professional Judgment. To do so, contact the Financial Aid Office to receive additional information about the process. What happens to my financial aid if I withdraw from a class? This can vary significantly from student to student, and depends on many factors. If you are considering withdrawing from a class and your receive financial aid, you are strongly encouraged to meet with a Financial Aid Administrator to discuss the possible impacts to your eligibility. What is Aid For Part Time Study (APTS)? Am I eligible? Students enrolled less than full time residing in NYS may be eligible for APTS. Students interested in this grant should contact the Financial Aid Office regarding Aid for Part-Time Study (APTS) criteria and application processing. Please note that APTS is a limited fund and is awarded on a first-come, first-serve basis. Matriculation is the act of enrolling in a program of study at SUNY Adirondack. To enroll, students must be accepted at SUNY Adirondack by the Office of Admissions. In order to be eligible for financial aid, students must be matriculated in a degree program and take classes required for this degree. If you are matriculated at another college and taking a class at SUNY Adirondack you are not eligible for financial aid through our school. Each year the federal processor selects 30% of all students nationwide who file the FAFSA for a review process called verification. If your FAFSA has been selected for the verification process, then additional information will be requested to verify information on the FAFSA such as household size, number in college, and income-related data. The FAO is unable to review a student’s eligibility for federal aid until this form and supporting documents is received. What's the priority date for FAFSA? When will my aid be disbursed? Estimated disbursement dates can be seen for each award on SSB. Federal loans are anticipated to disburse on the 5th and 9th week of each semester, and Pell is anticipated to disburse mid-November and late-March, respectively. TAP disbursement is determined by the state and is based on when your award appears on a roster provided by NYS. Because the school does not control this date the disbursement date in SSB appears as a future date. Note that TAP disbursement cannot occur prior to certification, which is the process by which the College verifies you are enrolled FT and meet good academic standing for the award. Where can I find Financial Aid forms? Financial aid forms can be downloaded on the website. You can also stop by the Financial Aid Office and request a copy of a form. Where do I complete the MPN? Entrance Counseling? Both the MPN and Entrance Counseling are federal loan requirements for new, first-time borrowers. These are completed online at www.studentloans.gov. Students login to this site using their FSA ID and the accompanying password. (This is the same ID you used to sign your FAFSA). If you have borrowed before but this is your first loan at SUNY Adirondack, you still must complete an MPN for SUNY Adirondack. Why do I need my parents' information? Students under age 24 who are not married, do not have dependents, and are not in the military are considered dependent for federal financial aid purposes, even if they do not live with or receive financial support from their parents. If you feel you have extenuating circumstances (i.e. domestic violence, parents are incarcerated) and are unable to provide parental information, please contact the Financial Aid Office for more information on your options. Why doesn't my work-study grant appear on my bill? Work study is a grant that is earned based on the hours of work the student complete, and as such the student is paid in the form of a paycheck bi-weekly. With the passage of the FY 2018 State Budget, New York is now home to the nation's first accessible college program -- The Excelsior Scholarship. Under this groundbreaking program, more than 940,000 middle-class families and individuals making up to $125,000 per year will qualify to attend college tuition-free at all CUNY and SUNY two- and four-year colleges in New York State. The new program begins in the fall of 2017 and will be phased in over three years. In New York State, every child will have the opportunity that education provides.